Skip The Bag: National Drinking Straw Day Jan 3rd. National Drinking Straw Day Jan 3rd. I'm not sure if you are familiar, but just about every day is used to celebrate and bring attention to something. In fact most days have 3 or 4 things that they help to celebrate. 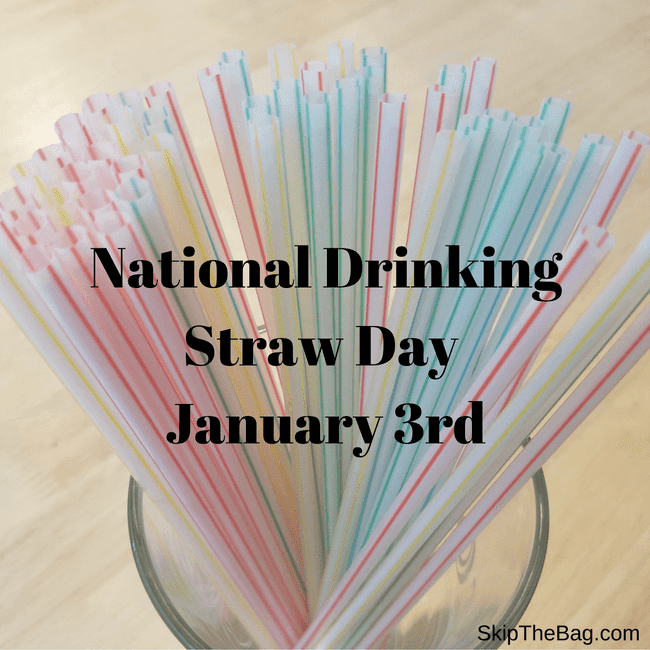 One of the things tomorrow, January 3rd, is that it is National Drinking Straw Day. 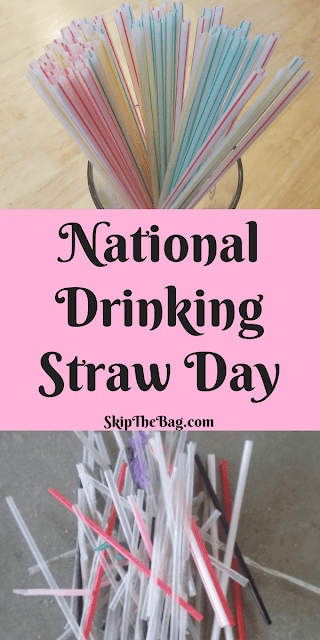 It is an unofficial holiday is thought to have been created to honor of the day that the first paper straw patent was filed in 1888 (National Day Calendar). Obviously around these parts we are not a huge fan of disposable, single use plastic straws because they are a huge source of pollution and waste. 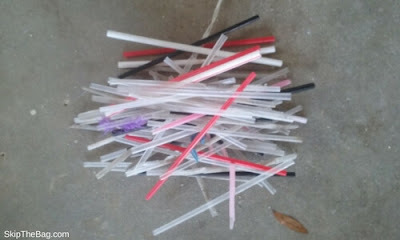 When I did an impromptu beach clean up a while back I picked up over 70 straws. Most of them were found right outside the bars, but since they are so lightweight a minimal breeze could have delivered them to the ocean. Also I've heard about (but not seen, because it would make me too sad) a video of a sea turtle who got a plastic straw stuck up her nose and it took scientists to remove it. Now there are some options other than using plastic straws. The first it to just drink out of the container and refuse a straw altogether. This would work in many instances, but not for everyone. So the next best option would be to buy paper straws. They are disposable and festive, but are also better for the environment. Ones like these could be fun for Christmas and these could be fun for New Years Eve. However, the most resource efficient would to be purchase a metal, glass or bamboo straw that is reusable. You will want a brush to clean them as they can get dirty and moldy. The brushes included in most of those packs are unfortunately made of nylon. 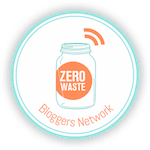 If you've got a non-plastic straw brush I'd love to hear about it! Although we've got some plastic brushes from our pre-SkipTheBag days and they are really durable and last a long time. So in honor of National Drinking Straw Day tomorrow, either refuse a straw or go buy a reusable straw! Looking to make even more of an impact with your cutlery? 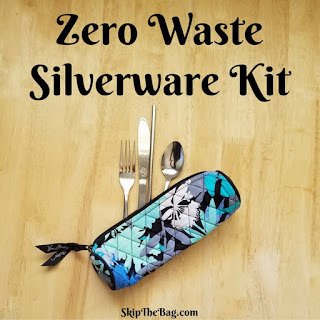 Check out Zero Waste Silverware Kits. I refuse straws on the rare occasion that we get something to drink other than home. It's such an easy thing to do. I think most folks are just in the habit of using them, but they are really unnecessary. I love when I see people bringing their own cups into a coffee shop to fill up. Good thinkin'! It's easy to do, but also easy for me to forget. Around these parts they serve almost every drink with a straw! 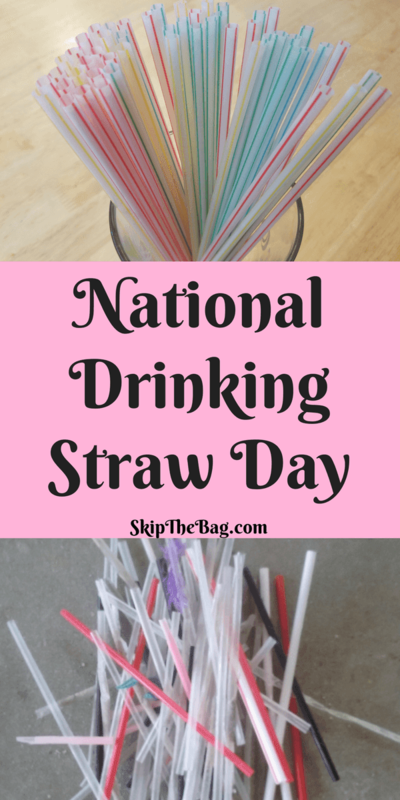 There is such a thing as National Straw Day?! We don't have days like that in Australia so I'm always hugely amused, and often a little confused, when hearing about them lol. Well it's not an official holiday, more just an homage...or maybe just a silly thing we do! I got some metal ones for Christmas and have started carrying it in my purse too. It's already come in handy several times! Oh gosh, I'm glad they are better about it! I try really hard to refuse straws whenever I go out. Unfortunately I find that the waiters I get forget roughly 25% of the time and put the straw in anyway. I understand that it's habitual for them to do so, and they're not purposefully sabotaging my efforts. It's still frustrating thought. Yes it is terribly disappointing when you remember to ask, but the waiter forgets!